​Glad rags and hand bags at the ready in the foulest weather imaginable, we and a lot of other people arrived in Dundee for the 13th Award event. After the Civic Reception it was onwards to Caird Hall where Table 35 was ours complete with wine and chocolates and then it was music and light till way after midnight. 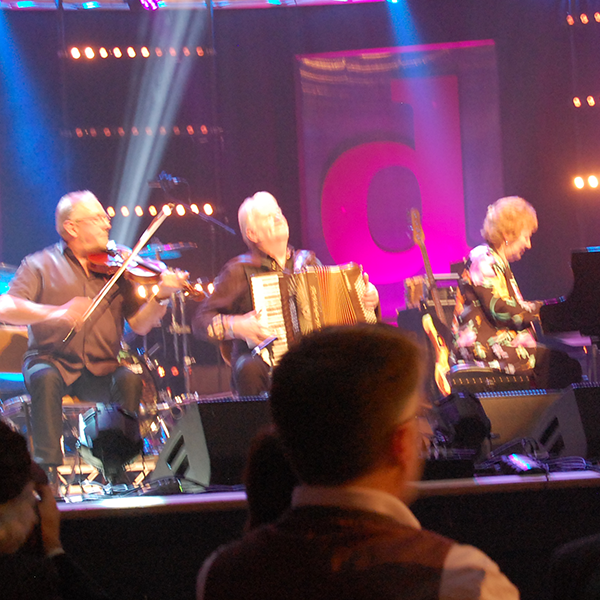 Broadcast live on BBC ALBA, BBC Radio Scotland and streamed globally through the BBC ALBA website for the first time ever, the awards, organised by Hands Up for Trad, saw stars of the Scottish music scene celebrate and honour traditional talent. The event was opened by the Peatbog Faeries and there were many other performances throughout the night. Our own Tom Orr performed early on and it was amazing how the audience really got into the swing of things while listening to his music. A much used word in the Club reports is ‘toe-tapping’ and that was what went on, while they were playing. Both he and fellow performer Marie Fielding were nominated in various categories, and they clearly showed why. Another performer we all know was Violet Tulloch who had Phil and Aly on stage with her. Needless to say she was very much appreciated. Culture Secretary, Fiona Hyslop was among many who spoke at the event, all praising Scottish traditional culture. You can read what they all had to say from the Hands up for Trad website. Now, who won the Scottish Dance Band of the Year, you are all wanting to ask me, so without further ado, the winner was … Simon Howie. 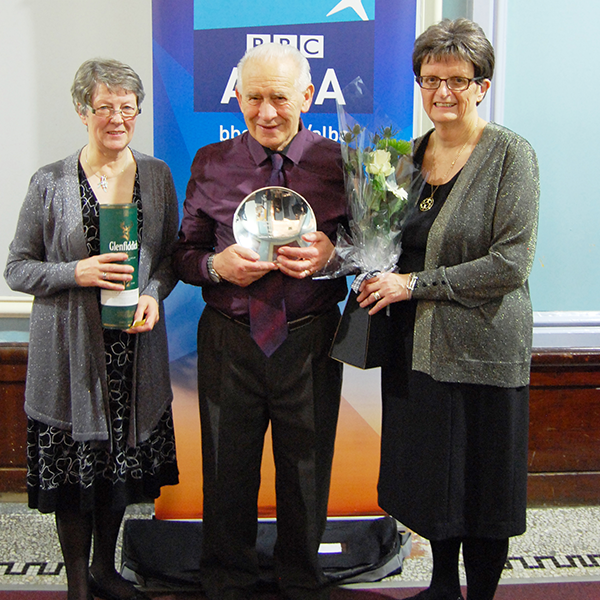 We had two clubs nominated for Club of the Year, Orkney and Haddington, and Orkney won. Many congratulations to Orkney, and also to Haddington for being nominated. To all of our nominees who didn’t win – in my eyes being nominated means that you are all winners. The Box & Fiddle was nominated for the Trad Music in the Media Award. Like all the nominees, I really wanted to win, but was ‘pipped at the post’ by Port, a BeesNees/TG4 series. Congratulations to them too. After finding that the Tay Bridge was closed due to high winds, we joined the Ceilidh to wait for the winds to die down and our taxi home. 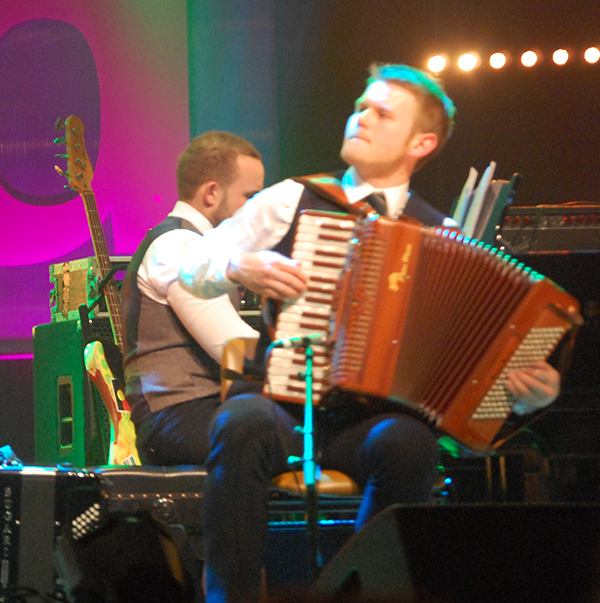 The 2016 Scots Trad Awards will return to Dundee’s Caird Hall on 3rd December, 2016.